Late one night in June of 1867, a young Mark Twain was out on the town when some of his friends suggested that they make a stop at Harry Hill's. 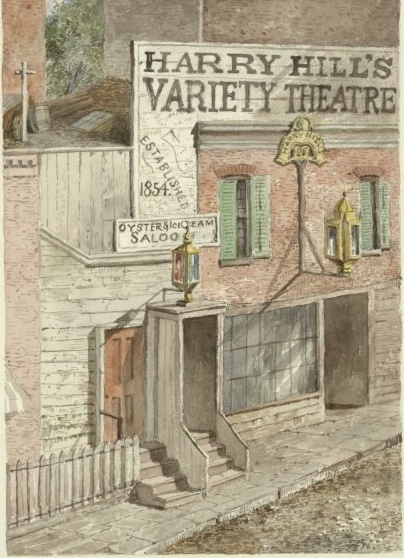 A combination of dance hall, theater and saloon, located on Houston and Crosby streets, Hill’s was just one of a number of similar establishments that had sprung up in New York City in the second half of the 19th century. Pretending that they were going to a place of high moral repute, Twain and his group proceeded down to Houston Street where they were greeted by a large red and blue lantern attached to a dingy two story building. A small side door next to the main entrance led up the stairs and was used only by the female patrons, who were admitted free of charge. Men had to pay twenty-five cents at a downstairs window to gain admittance. Hill had little tolerance for impropriety, and proudly boasted that no one was ever killed or robbed on his premises. A contemporary author, writing a travel guide to New York in 1872, told a different story, warning that Harry Hill's was a place where pick-pockets, murderers and other criminals would hatch their plans and choose their victims. Once in a while, the danger lurking just outside would make its way in. One night, a shot fired through the window, precipitating an assault on a patron by a gang of men. When Harry tried to intervene, he was also badly beaten. Drunkenness inside the establishment was not tolerated and Twain would have clearly seen a large sign on the wall: PEOPLE WHO ARE DRUNK MUST LEAVE THE PREMISES.8 Those unable to hold their liquor were promptly ejected. 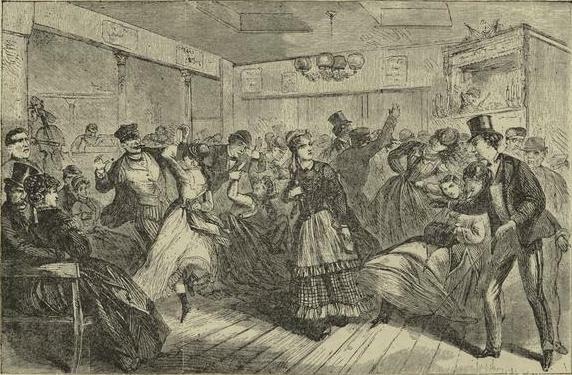 Although they did not live above the establishment, women of questionable character often visited Harry Hill's and men were required to show them the utmost respect and, “to treat them as ladies, even if they weren’t.”12 Men were expected to buy drinks for the female patrons and be liberal in their expenditures. Twain got a taste of these expectations the night he visited Hill's, when he had a memorable exchange with a woman. "Oh, if you want to shoot your gab," the woman said. "Take me up to the bar, and pizen me, and then you can yelp till you rot." Harry's hall with men from all over the world coming to fight championship matches there. In 1876 the manager had the idea of staging the first female fight. A tempting prize of $200, plus a silver-plate immediately produced two volunteers. Nelly Sauders, twenty-four years old and five-foot-six, was set to fight twenty-five year old, five-foot-seven inch Rose Harland, both dancers and dilettantes. On the day of the fight the house was packed. The paper wrote that both fighters, “appeared exceedingly nervous, were very pale, tried to blush and partially succeeded.”15 After three rounds, some of which were “lively and hard,” Nelly Saunders was declared a winner and both boxers left the stage arm in arm. It wasn’t a total loss for Rose Harland who was awarded $10 as a consolation prize. In the mid-1880s, with growing pressure from the temperance and moral crusades, it became harder and harder to keep the business open. When Hill’s liquor license came up for renewal, he was denied. Refusing to continually subject himself to shakedowns by police, Hill threw in the towel and folded up shop. He died in poverty a decade later. Anbinder, Tyler, Five Points, New York, NY: 2001. Every, Edward Van, Sins of New York, As “Exposed” by The Police Gazette, New York: Frederick A. Stokes Company, 1930. Peiss, Kathy. Cheap Ammusements: Working Women and Leisure in Turn-of-the-Century New York, Philadelphia: Temple University Press 1986. Martin, Edward Winslow, The Secrets of the Great City: A Work Descriptive of the Virtues and the Vices, the Mysteries, Miseries and Crimes of New York City. Philadelphia, PA: Jones, Brothers & Co.,1868. McCabe, James Dabney, Lights and shadows of New York life: or the sights and sounds of the great city. Philadelphia, PA: The National Publishing Co., 1872. Ravitch, Diane, The Great School Wars. Second Edition. Baltimore, MA: Johns Hopkins University Press, 2000. Dane, Erza G and Frankilin Walker, collectors and eds. Mark Twain's Travels with Mr. Brown: Being Heretofore Uncollected Sketches Written by Mark Twain for the San Francisco Alta California in 1866 and 1867, Describing the Adventures of the Author and His Irrepressible Companion in Nicaragua, Hannibal, New York and Other Spots on Their Way to Europe. New York: Russell & Russell, 1971. 270-274. The Cambridge history of English and American literature: An encyclopedia in eighteen volumes, ed. by A.W. Ward, A.R. Waller, W.P. Trent, J. Erskine, S.P. Sherman, and C. Van Doren. New York, NY: G.P. Putnam’s Sons; Cambridge, England: University Press, 1907–21. Volume XVII, Later National Literature Part II, Section VIII Part 5. The New York Times, November 1, 1870, 1; April 11, 1873, 5; August 8, 1873, 8; February 26, 1874, 8; February 27, 1874, 1; February 28, 1874, 7; March 2, 1874, 5; March 17, 1876, 8; December 8, 1882, 8; April 19, 1884, 8; February 3, 1886, 1; February 17, 1886, 8; September 26, 1886, 8; October 6, 1886, 3; October 20, 1888, 8; June 21, 1894, 1; August 31, 1896, 6. I added some general social and political context of New York City in the 1850s-70s. I also added general information about other dance halls, bibliographic information about Harry Hill, and bibliographic information about Mark Twain. I added links that contributed bibliographic information about a few of the characters in the story. I also added some links which pointed to secondary historical and scholarly sources that provided an overview of the subject that is highlighted. I also linked to some primary sources, so that the audience could understand how an historian collects his/her information. I also used open-source primary sources for the images, so the audience may have a better understanding of how these stories were circulated and depicted when they occurred. I added photo credits to the photographs I added last week. I made a bunch of changes to the essay. I cut some words or sentences that I thought were redundant or didn't belong or work as good as they could. For example, I cut the sentence about the different heights of the ceiling at Hill's, even though I thought it was really interesting and an interesting visual. It didn't go with the rest of the paragraph and didn't seem to connect with anything else in the story. I moved two paragraphs around — these are the ones that talk about the crime and poverty in NY in Boss Tweed's era, and I moved these up to the section on violence at Hill's because they seemed to connect naturally with that section, and it also made things clearer on the Twain storyline to have them moved. I hope this helps the Twain passages flow a bit more, because I thought they were scattered too much throughout the essay. I also played around with the anecdote about Twain and the woman, though I think it could use something, especially to break up Twain's long quote. I was hesitant to play around with it too much because I don't know the details or context. I added some historical themes to the sentence about the dance clubs coming out of a demand for mass entertainment (I changed "need" to "demand") caused by population growth, and got a little more specific. Some other things weren't clear — like the fact that Twain was "undeterred" when he went in to Hill's. I was assuming that you meant he was undeterred by the cost, or at least that's how it read. I took it out but you may have meant something else. I thought you did an incredible job with the primary sources, digging them up and weaving them into the essay, and synthesizing them with the secondary material. There are some great details, and you really convey a sense of the time period. Very interesting, informative and a lot of fun to read. My only overall stylistic comment would be to try to make the Twain material and Harry Hill's material balance each other out. I also though that the images looked terrific on the screen. Good job Chelsea. You guys did a good job editing the essay. I had originally included much of the same information that Chelsea added but I had cut it to try to adhere to the 1000 word limit. This time I decided to leave most of the information in, taking out a few things I felt were unnecessary or that I thought alluded to elsewhere in the essay. For example, I removed "Many of these businesses were created out of the demand for mass entertainment, as America's population was growing exponentially, a result of intense industrialization, the growth of cities and immigration" from the start of the essay because this repeats the original conclusion of the essay. I have also removed some of the background information on the external conditions of New York City and some of the information on Mark Twain. Overall I think the essay reads much better. Thanks again! "Harry Hill's Variety Theatre." ephemeralnewyork.files.wordpress.com. "A Scene at Harry Hill's Dance Hall." theboweryboys.blogspot.com. 14. The Cambridge History of English and American Literature in 18 Volumes, section viii part 6. 15. New York Times, March 17, 1876, 8.